I've learned that I can't change the past, but I can let it go. Listen to an audio tape about the benefits of pH balancing. 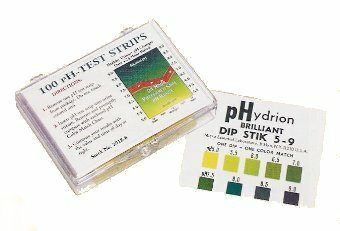 Monitor your urine and saliva pH with our Test Strips. High acidity can become a dangerous condition that weakens all major body systems. It makes your internal environment conducive to disease. A pH-balanced environment, on the other hand, allows proper metabolic functioning and gives your body resistance to disease. A healthy body maintains alkaline reserves that are used to meet emergency demands. pH measures the balance between positively and negatively charged ions in the body fluids, i.e. blood, urine and saliva. A low pH number (below 7) indicates that your body fluid is on the acidic side. A high pH number (above 7) indicates you have alkalinity. A pH of 7.0 is considered neutral; this is the pH of distilled water. This delicate balance can be an important indicator of overall health. Researchers find that most people are at least slightly "acidic"; their pH is low. If your pH is too acidic, your body borrows minerals - such as calcium, magnesium, potassium and sodium - from vital organs and bones to neutralize and remove the acid. Although high acidity may not be outwardly noticeable, it can severely affect overall health in a negative way. Alkalinity in the body is much more rare, but just as potentially serious. It often takes longer for a person who is "alkaline" to achieve balance than one who is "acidic." "Now we depart from health in just the proportion to which we have allowed our alkalies to be dissipated by introduction of acid-forming food in too great amount... It may seem strange to say that all disease is the same thing, no matter what its myriad modes of expression, but it is verily so." William Howard Hay, M.D. More recently, in his remarkable book Alkalize or Die (see recommended reading), Dr. Theodore A. Baroody says essentially the same thing: "The countless names of illnesses do not really matter. What does matter is that they all come from the same root cause...too much tissue acid waste in the body!" Theodore A. Baroody, N.D., D.C., Ph.D.
pH (potential of hydrogen) is a measure of the acidity or alkalinity of a solution. It is measured on a scale of 0 to 14 -- the lower the pH the more acidic the solution, the higher the pH the more alkaline (or base) the solution. When a solution is neither acid nor alkaline it has a pH of 7, which is neutral. Water is the most abundant compound in the human body, comprising 70% of the body. The body has an acid-alkaline (or acid-base) ratio called the pH, which is a balance between positively charged ions (acid-forming) and negatively charged ions (alkaline-forming.) The body continually strives to balance pH. When this balance is compromised many problems can occur. It is important to understand that we are not talking about stomach acid or the pH of the stomach. We are talking about the pH of the body's fluids and tissues, which is an entirely different matter. Most people who suffer from unbalanced pH are acidic. This condition forces the body to borrow minerals -- including calcium, sodium, potassium and magnesium -- from vital organs and bones to buffer (neutralize) the acid and safely remove it from the body. Because of this strain, the body can suffer severe and prolonged damage due to high acidity -- a condition that may go undetected for years. Cardiovascular damage, including the constriction of blood vessels and the reduction of oxygen. Weight gain, obesity and diabetes. Bladder and kidney conditions, including kidney stones. Acceleration of free radical damage, possibly contributing to cancerous mutations. Weak, brittle bones, hip fractures and bone spurs. Joint pain, aching muscles and lactic acid buildup. Low energy and chronic fatigue. Minerals Buffer Acids - A recent study conducted at the University of California-San Francisco on 9,704 postmenopausal women showed that those who have higher acidity levels (also called chronic acidosis) from a diet rich in animal foods are at greater risk for lower bone density levels than those who have "normal" pH levels. The researchers who carried out this study hypothesized that many of the hip fractures prevalent among older women correlated to higher acidity from a diet rich in animal foods and low in vegetables. The body apparently borrows calcium from the bones in order to balance pH, and this calcium borrowing may result in a decrease in bone density. -American Journal of Clinical Nutrition, Jan. 2001, Vol. 73, No.1, pp. 118-122. Urine pH - Urinary pH levels can indicate how well your body is assimilating minerals, especially calcium, magnesium, sodium and potassium. These are called the "acid buffers" because they are used by the body to control acid levels. When acid levels begin to increase, the body becomes less capable of excreting acid. It must either store the acid in body tissues, or buffer it-that is, borrow minerals from organs, bones, etc., in order to neutralize the increase in acidity. Urinary pH should fluctuate between 6.0-6.4 in the morning and 6.4-7.0 in the evening. Over acidity, which can become a dangerous condition that weakens all body systems, is very common today. It gives rise to an internal environment conducive to disease, as opposed to a pH-balanced environment which allows normal body function necessary for the body to resist disease. A healthy body maintains adequate alkaline reserves to meet emergency demands. When access acids must be neutralized our alkaline reserves are depleted leaving the body in a weakened condition. Your body is able to assimilate minerals and nutrients properly only when its pH is balanced. It is therefore possible for you to be taking healthy nutrients and yet be unable to absorb or use them. If you are not getting the results you expected from your nutritional or herbal program, look for an acid alkaline imbalance. Even the right herbal program may not work if your body's pH is out of balance. 1. Enzymes are essential: Take 1-2 capsules of Food Enzymes or Proactazyme with every meal. If you have both over-acid urine and saliva, also take 1-2 capsules of Protease Plus between meals on an empty stomach. 2. Correct calcium is needed: 1-2 small scoops of Coral Calcium each day. This is a very alkalizing form of calcium. Or, take 4-6 Skeletal Strength tablets daily. This contains a very absorbable calcium and magnesium. Children should use liquid calcium. 3. Alkaline minerals are essential: Take 1 ounce of Mineral Chi Tonic once daily, or take 1 teaspoon of Liquid Chlorophyll in water up to eight times daily. 4. Anything green is alkaline: Take Ultimate GreenZone or Potassium Combination according to label directions. Eat more fruits and vegetables and less animal products. 5. Vitamin A & D hold calcium in the body. Taking Vitamin A & D will help the body buffer acid. 6. What if my pH is still too acidic? As a temporary measure take 2 Stomach Comfort tablets twice daily between meals. (Not for long-term use.) Monitor your pH daily. 7. Cleanse as needed: Take a psyllium hulls supplement such as Psyllium Hulls Combination at bedtime to maintain regular bowel movements. Use Chinese Tiao He Cleanse or CleanStart twice a year for liver, bowel and kidney detoxification. Get the book! Get a copy of the book Alkalize or Die by Dr. Baroody (see recommended reading below) and carefully follow his dietary recommendations choosing more foods that are alkaline-forming and less that are acid-forming. A healthy diet should consist of 80% alkaline-forming foods and 20% acid-forming foods. What Causes Me to be Acidic? The reason acidosis is more common in our society is mostly due to the typical American diet, which is far too high in acid-producing animal products like meat, eggs and dairy, and far too low in alkaline-producing foods like fresh vegetables. Additionally, we eat acid-producing processed foods like white flour and sugar and drink acid-producing beverages like coffee and soft drinks. We use too many drugs, which are acid-forming; and we use artificial chemical sweeteners like NutraSweet, Equal, or aspartame, which are extremely acid-forming. One of the best things we can do to correct an overly-acid body is to clean up the diet and lifestyle. Refer to the recommended reading for specific help with diet and lifestyle. Alkalinity is relatively rare, but if your urine and/or saliva consistently test above 7.0 pH, start with steps 1, 2 and 3 below and continue adding steps until the desired results are achieved. 1. Enzymes are essential: Use 1-2 capsules of Proactazyme with each meal. For stronger enzymatic action in difficult cases add 1-2 capsules of Protease Plus between meals on an empty stomach. 2. Correct calcium is needed: Take 4-6 Skeletal Strength tablets daily. 4. Flax Seed Oil: Use 1 capsules of Flax Seed Oil 3 times a day or 2 tablespoons of oil daily. 5. Ultimate GreenZone: Follow label directions. 6. Cleanse as needed: Take a psyllium hulls supplement such as Psyllium Hulls Combination at bedtime to maintain regular bowel movements. Use Chinese Tiao He Cleanse or CleanStart twice a year for liver, bowel, and kidney detoxification. Note that a food's acid or alkaline-forming tendency in the body has nothing to do with the actual pH of the food itself. For example, lemons are very acidic, however the end-products they produce after digestion and assimilation are very alkaline so lemons are alkaline-forming in the body. Likewise, meat will test alkaline before digestion but it leaves very acidic residue in the body so, like nearly all animal products, meat is very acid-forming. Alkalize or Die by Dr. Theodore A. Baroody, Available at Amazon.com for around $5.00.